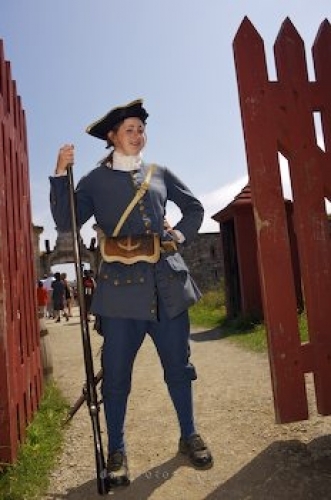 A girl dressed in a soldier costume guards the gate to the entrance of the Fortress of Louisbourg in Cape Breton, Nova Scotia. When you visit the Fortress of Louisbourg in Cape Breton, Nova Scotia you will step back in time and tour a French fortified town which is the largest reconstructed one dating back to the 18th century. People in costume like this soldier that guards the entranceway to the fort are seen throughout this tourist attraction and reenact life from this time period. Soldier guarding the gate at the entrance to the Fortress of Louisbourg National Historic Site, Louisbourg, Fleur de lis Trail, Marconi Trail, Highway 22, Cape Breton, Nova Scotia, Canada. Picture of a soldier protecting the gate at the Fortress of Louisbourg in Nova Scotia.